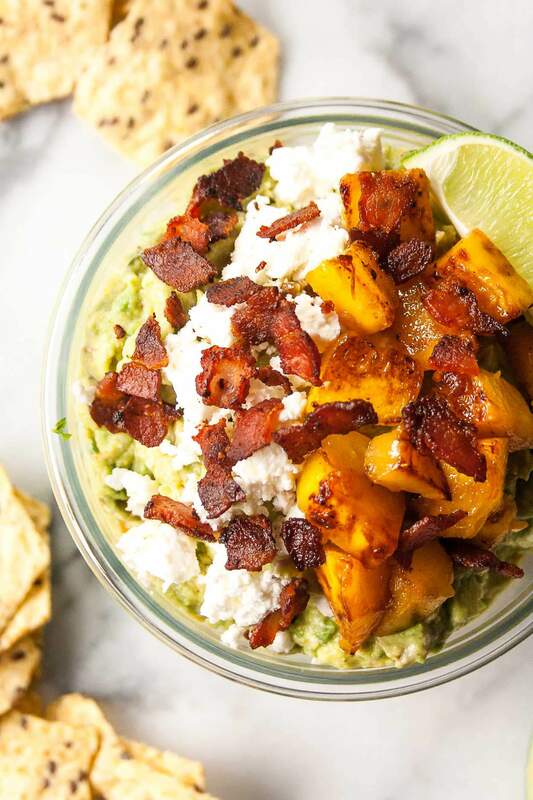 Bursting with flavor, this outrageous caramelized mango bacon and goat cheese guacamole is the only way to celebrate Cinco de Mayo! All you need is a bowl of tortilla chips and a margarita in the other hand! This post is sponsored by Casabella. As always, all opinions are my own. Thank you for supporting Hungry by Nature and the brands that make it possible! 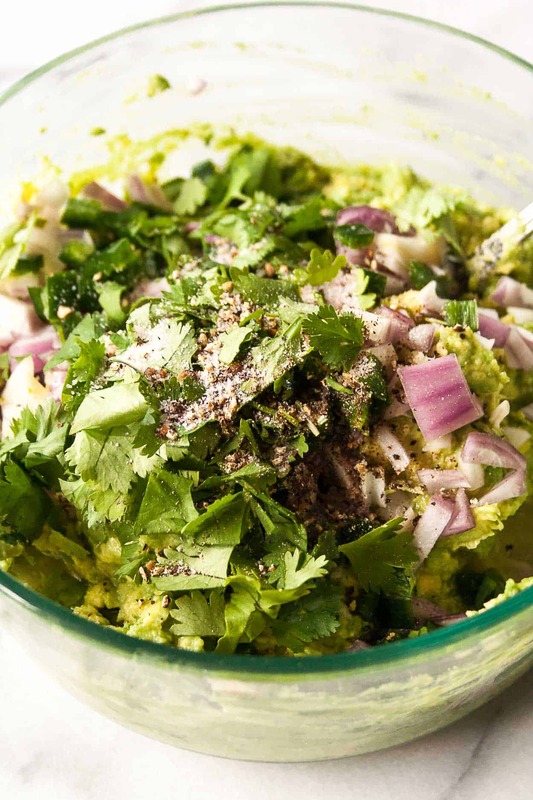 My go-to guacamole recipe is tried and true – avocado, jalapeno, red onion, cilantro, salt, pepper, and lots of lime juice. And while I often feel like it’s not good to mess with a classic, I’m so glad I messed with this classic! 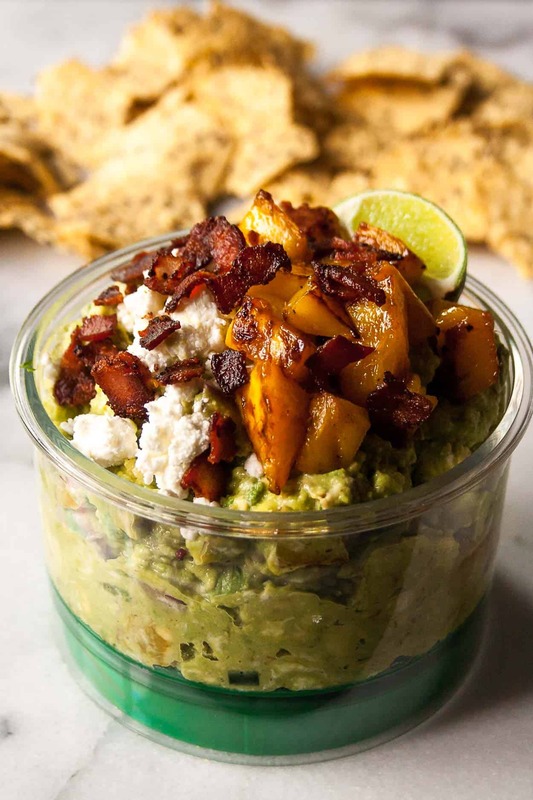 This caramelized mango bacon and goat cheese guacamole is outrageous! Are you seeing what I’m seeing?! I know what you’re thinking and YES, I did caramelize the mango in the bacon fat. And yes, the goat cheese is 100% necessary. Don’t question, just do it. So I didn’t actually mess with the classic. I’ve got all the usual players here; but I’ve expanded on the recipe. Brought it up a few notches. Took it to a whole new level. And you’re gonna LOVE it. But here’s the bad news. It’s difficult to keep guacamole fresh and green for an extended period of time (read: like making it at home and bringing it to a Cinco de Mayo party at a friend’s house). I’ve tried all the tricks – covering it in saran wrap, leaving the pits in the bowl, covering the surface with lemon juice/water all to keep the oxygen from turning it brown. Guess what?? They don’t work. But I’ve found something that does! The Guac-Lock! I’m not normally one for kitchen gadgets that only serve one purpose; but I’ve already used my guac-lock more times in the past month than the spiralizer I bought 3 years ago. Sweet caramelized mango. Of course. Tangy goat cheese. Why the heck not?! 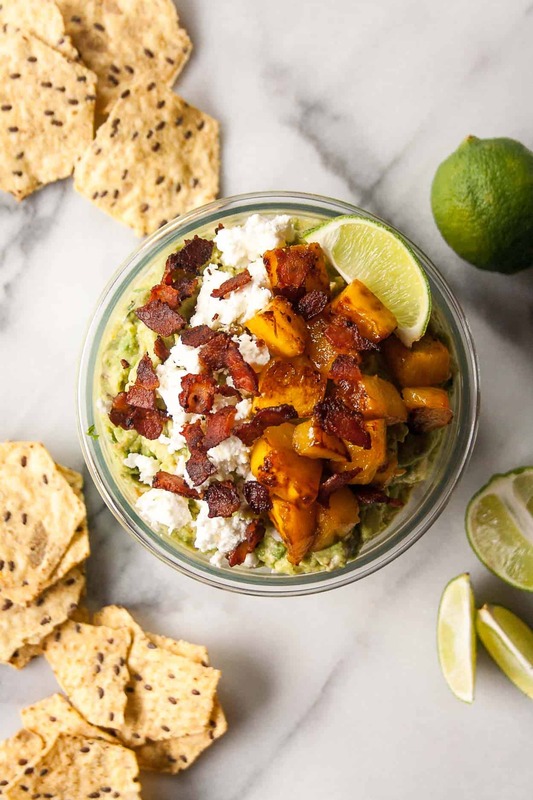 Celebrate Cinco de Mayo this weekend with this insane Caramelized Mango Bacon and Goat Cheese Guacamole! Make sure to post a picture on social media and use the hashtag #imhungrybynature for a chance to be featured! Heat a large skillet over medium-low heat and add the bacon. Cook until totally crispy and the fat is rendered, stirring occasionally. Remove the bacon with a slotted spoon and place it on a paper towel to drain the grease. Increase the heat under the skillet to medium and add the mango cubes, tossing to coat. Cook until the mango gets golden brown, about 8 to 10 minutes, flipping once or twice to caramelize all sides. Remove and let the mango cool slightly. 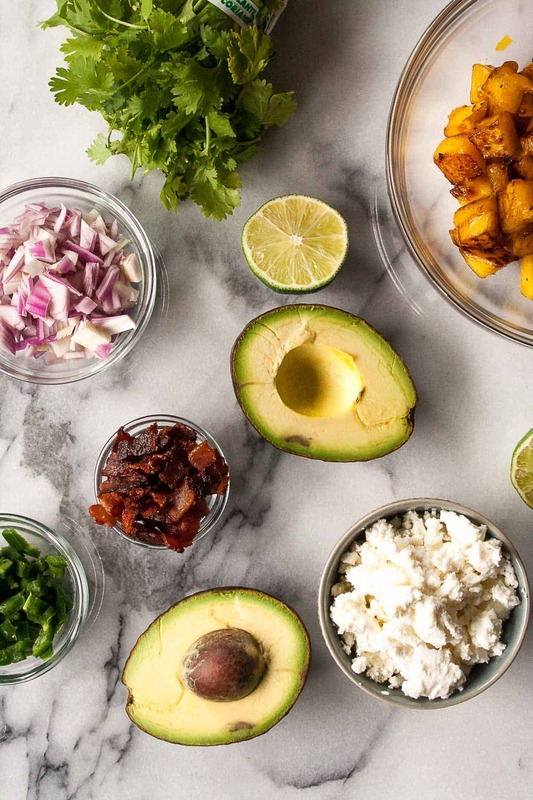 In a large bowl, mash together the avocado, jalapeno, onion, cilantro, the juice of 2 limes, salt and pepper. Taste and season additionally if desired. 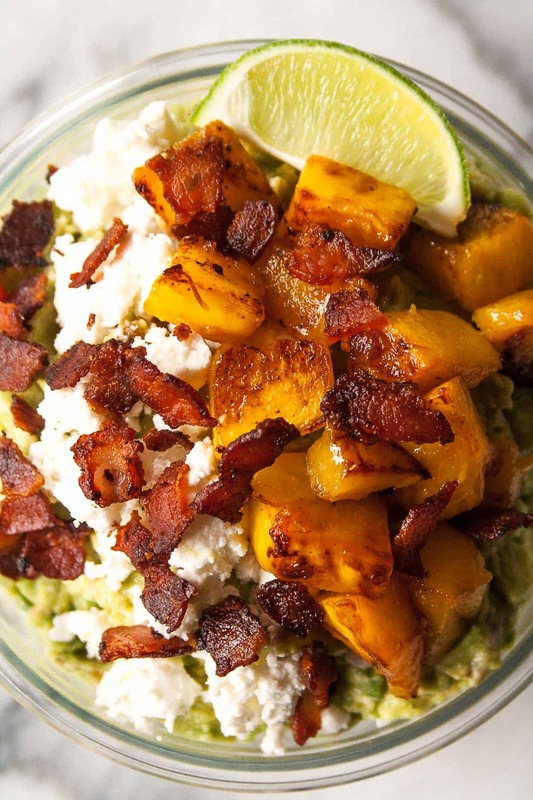 Stir in almost all of the mango and bacon, then stir in the goat cheese. 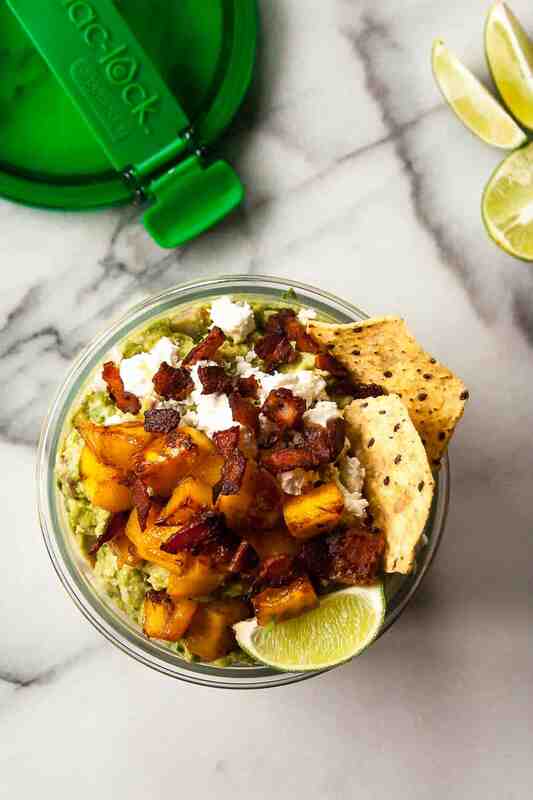 Scoop the guac into a bowl to serve and top with the remaining mango and bacon for garnish. Serve immediately. Make sure to pin this for Cinco de Mayo!